Tired of holding your eyebrows up to put on eye shadow or do you need a fresher look to remain competitive on the job? You are not alone. Poets describe the eyes as the window to the soul, but nobody waxes eloquent about the extra long curtains draping these older windows! With the passage of time eyelid skin sags, fat bulges appear and dark circles form under your lower eyelids. My wife talks fondly of her crazy Aunt Bessie who used to put strips of scotch tape under each eye to hold the bags in. Sort of a do it yourself blepharoplasty. Now, if you just asked yourself, “I wonder if that would work?”, it might be time to visit with a Plastic Surgeon and put away the scotch tape. For most people the first signs of aging occur around our eyes. Many women, even in their 20s, can be plagued with dark circles under their eyes. There are multiple influences that create these dark circles that form at the junction of the lower eyelid and the upper cheek skin often referred to as the tear trough deformity. Many younger patients can be treated successfully with dermal fillers to dramatically improve that sad and tired look associated with the tear trough deformity. As we enter later decades, there is more skin laxity and more puffiness of your eyelids. These changes often distract from your natural beauty. Fillers can help, but surgery becomes a better option for many patients. Blepharoplasty, eye lift surgery, is one of the third most common cosmetic procedures performed in the United States and it well tolerated by both men and women. An eye lift requires an incision along the upper eyelid crease of the upper eyelid and just below the last line of the lower eyelid. Excess skin and fat can be removed or repositioned and incisions closed. This will give your eyes a crisp upper lid and gets rid of the fat bags. In Tyler, eyelid surgery is an outpatient procedure and most patients can return to work in 10 to 12 days postoperatively. Immediately post-op we anticipate swelling, bruising, blurred vision, eye irritation or dry eyes and discomfort which is controlled with medications and cool compresses. 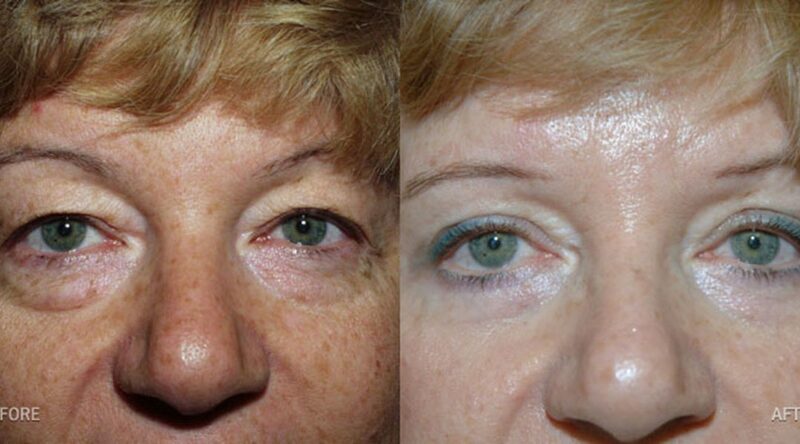 With the help of my fantastic staff at Cosmetic and Plastic Surgery Tyler, our blepharoplasty patients get great results and are thrilled with their new look. Our patient’s boast on how refreshed and youthful they look. The specific surgical approach will be based on your aesthetic goals and your unique anatomic issues. I commonly find patients complain that other people ask if they are feeling okay…because they appear sad and tired even though they are not. It is frustrating for them and they often believe that the primary problem is the extra upper eyelid skin. However, I am impressed that the tear trough deformity is the feature other people see which they relate to looking sad and tired, not usually their upper eyelid sagging skin. The good news is techniques are available to correct this deformity. For more detailed information, a consultation is advised to establish if this procedure is right for you. Our office would be pleased to schedule your appointment at 903-535-7722.